Robert Kennedy’s Cuban Missile Crisis papers: Why do they remain a secret? 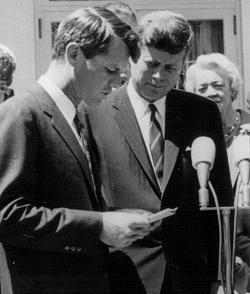 Why is it taking RFK’s family so long to show us his papers from the Cuban Missile Crisis? “I had the strong feeling,” recalled McGeorge Bundy, John F. Kennedy’s national security adviser, two weeks after the Bay of Pigs in 1961, “that if the military had said calling off the air strikes would have caused the operation to fail, the president would have reversed his decision.” Autopsies are never pretty, especially when they are of government fiascos. Just before the start of the operation a poorly advised president, who already had misgivings about a covert operation, made a stupid military decision. He decided to take a risk on letting an invasion go forward without destroying Fidel Castro’s air force. The John F. Kennedy Library and Museum’s release Thursday of Robert F. Kennedy’s Cuban files opens the most we have ever seen of the former attorney general and First Brother’s collection of documents on the Bay of Pigs, the Cuban missile crisis of 1962, and the ongoing push against Castro in 1963. There aren’t many revelations but, in one important regard, everything is new. As the Dowager Countess so often reminds us in Downton Abbey, blood matters. After the Bay of Pigs, JFK took that to heart, bringing RFK into his most sensitive foreign policy decisions. For the first time, scholars can see the full range of what mattered enough to the attorney general during the long meetings of the Executive Committee (ExComm) during the missile crisis for him to make notes of it. And Bobby was often sensitive to the political dimension of things. This is intriguing stuff. But it begs the question: Why did it take so many decades for us to see it? Why does it seem that information on long-dead presidents tends to dribble out? We live in a republic, of course, but until Watergate all presidents, whether Republican, Democratic, or Whig (remember them?) treated documents as if we were a monarchy. Until Richard Nixon committed incontrovertible abuses of power and then brazenly tried to cover them up, a president owned his papers and he and his family could dispose of them as they wished. In the 19th century, many presidential papers were sold or destroyed. For most of the 20th century, they were deeded to the American people, with a nice tax write off for the family. Congress only changed this in 1978 by passing the Presidential Records Act. The law did not cover earlier presidencies. But from Reagan going forward we all own our president’s papers. The fact that this took over 200 years led to weird situations such as in 1962 when John F. Kennedy, who was engaged in sensitive negotiations with French President Charles de Gaulle, had to ask his predecessor’s permission to view documents about what promises Washington may have made to the French during the Suez crisis of 1956. In the 18th century, when the office of the president was more symbolic than operational, this approach to the president’s household materials made some sense—but was based on the practices of King George III. By the nuclear age, with so much policy being generated by the White House, it made no sense at all. But presidents are powerful people and there was no branch that could force them to hand over their documents and, frankly, until Watergate the American people did not seem to care. Sadly, Robert Kennedy did not live to fully contest the presidency. But in his approach to presidential records, he and, after June 1968, his heirs acted as if they had been the Kennedys in the White House. After Dallas, RFK took control of his brother’s famous secret tape-recordings and, when they were under his control, lost or destroyed at least five of them. RFK also decided that since his brother had brought him into White House policymaking after the Bay of Pigs, his own documents should be treated as if they were presidential. As a result, they were placed with JFK’s papers, tended to by trained government archivists, and protected in a government facility. The JFK family, however, ultimately signed a deed and the American people acquired ownership over President Kennedy’s materials, which can be consulted at the JFK Library. The RFK family, however, did not. So, the papers stayed at the JFK Library, safeguarded with taxpayer money, yet closed to all but the family and selected others. RFK was a complicated figure. But one thing that is not complicated about him is that he was murdered. He was murdered during the American public’s exercise of political free speech. His murder was a crime to him and his family and an attack on the entire country: Who was going to put pressure on his family for his documents? The JFK family, as evidenced by Caroline Kennedy Schlossberg’s decision last year to release, unabridged, her mother’s very candid 1964 interviews with Arthur Schlesinger, Jr., has embracedits role in the stewardship of history. Now it appears that RFK’s family is learning from their cousins. News reports suggest that the family, which has apparently still not deeded over the collection, will nevertheless allow scholars to see the rest of it in the near future, subject to declassification review. Bobby was not just consulted about Cuba; there is a lot more RFK national security material to be released. Last week’s release was only a start, but it was an excellent one.